The contrast between the battlefield of Kurukshetra and the dance in Madhuvana is stark. War here, dance there. Men here, women there. Blood here, milk there. Rage here, romance there. Day here, night there. Public here, secret there. Field here, forest there. Imminent violence here, sexual tension there. 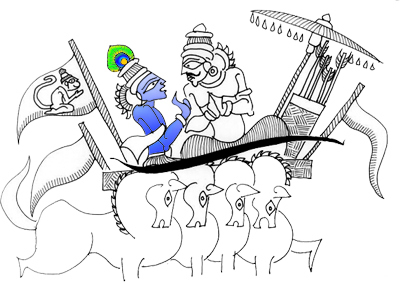 By overturning established notions of righteousness and appropriateness related to property in the Mahabharata and related to fidelity in the Bhagavata, Krishna draws attention to an underlying theme, the Vedic theme, of how the mind perceives information differently depending on the level of wisdom. Since there are infinite levels of wisdom, there are infinite ways of seeing the same thing. Only the expanded mind (brahmana) can see infinity (ananta).